Additional Info: *Please Note*: Maximum occupancy for this van is 5 adults and 1child or a combination there of. This is because the fold down bed in the 3rd bedroom is only suitable for a child and not an adult. Weekly from Saturday to Saturday.15.00hr check in,depart 10.00am. £100 deposit to hold booking. Full balance required 6 weeks prior to holiday.£150 Security Deposit (fully refunded in the event of No Damage and van being left in a clean and tidy condition) Small breakages classed as wear and tear and will not be charged for unless you happen to break a full dinner service!. Please tell me the total of Adults and children in your party and whether you would like to bring a dog along with you. Please state breed and age of dog. You must be 18 years or over to book this van and you are responsible for all in your party. 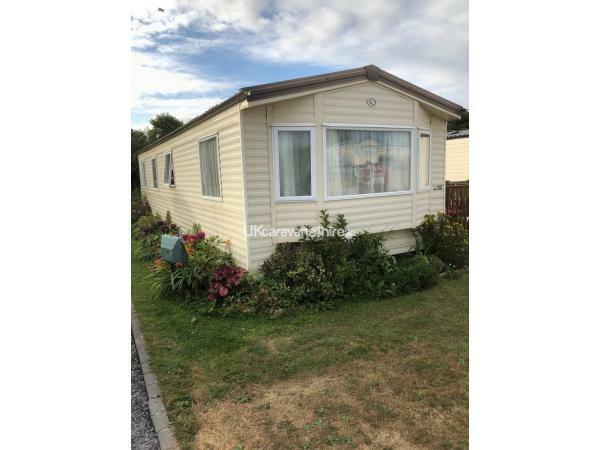 Lovely spacious Newly Refurbished in a Stunning Beach Theme double glazed 3 bed 6 berth caravan situated in a great spot on Seven Bays Park, St. Merryn ,Nr. Padstow. 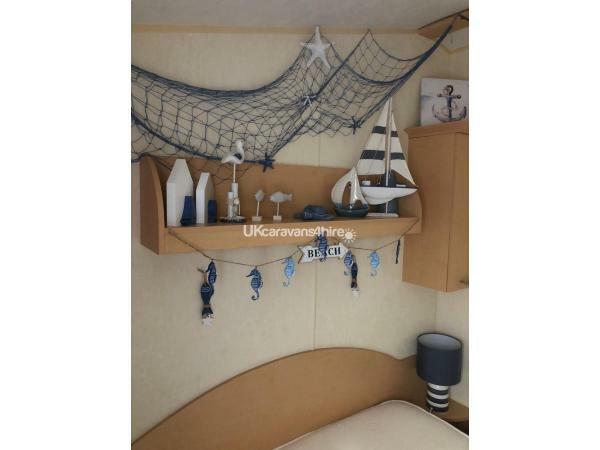 The 3 bedrooms are as follows: Bed 1 has a double bed with storage to sides and shelf over, wardrobe and vanity area. Bedroom 2 has 2 single beds with storage over, wardrobe and mirror. Bedroom 3 has 2 single beds one of which folds back to the wall, (only suitable for a child) shelving overhead, wardrobe and mirror. There is a good sized shower, basin and mirrored cabinet in the shower room. Separate WC with a wash basin. 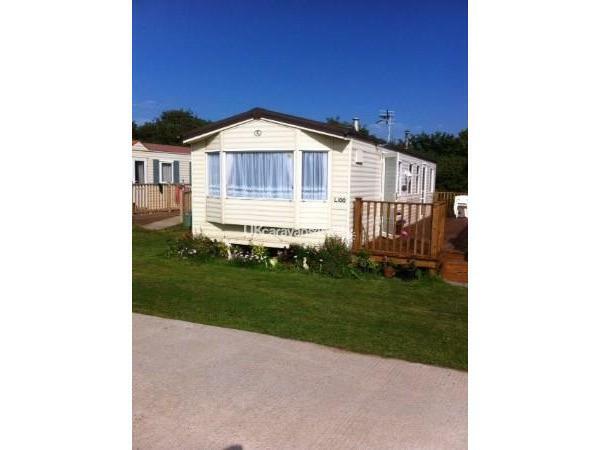 All bedrooms,Shower, WC are situated off the central hallway, where there is also a door onto the decking area. 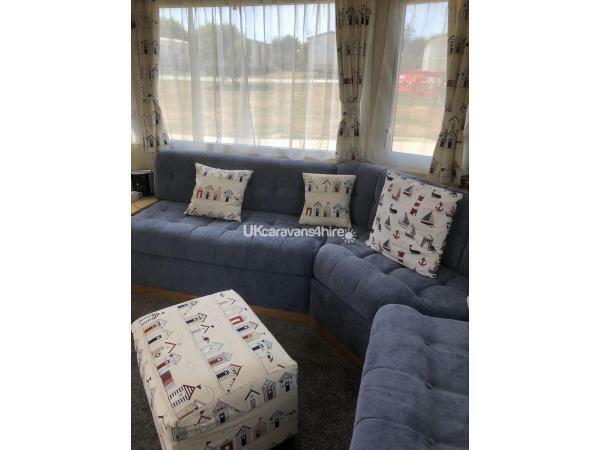 The Lounge and kitchen are open plan and consist of the following: Kitchen has a full sized gas cooker with oven, separate low level grill and 4 hobs. Microwave, Fridge, Toaster, Kettle and coffee machine (Dolce Gusto Pod Type) Dining table with seating. 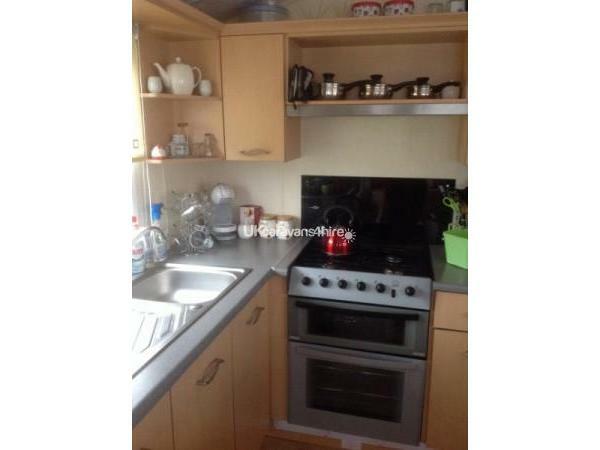 Fully equipped with plenty of crockery, cutlery, saucepans and glassware. There are also picnic plates and a cool box for your convenience. 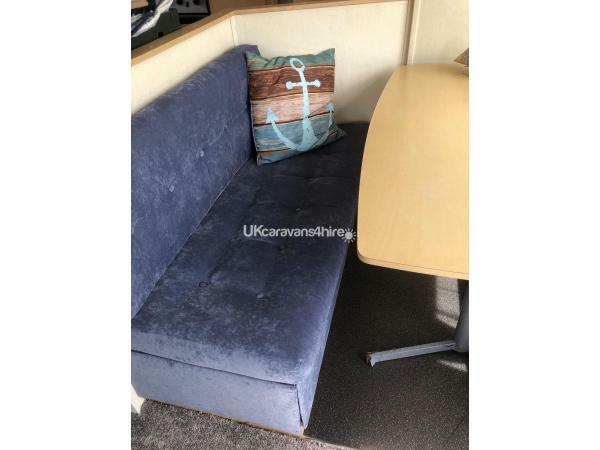 Lounge has wrap around seating, gas fire, lamp, mirror, TV/DVD combo and a CD player. There are various DVDs including children's titles for you to use. Also a selection of books. If you have children in your group I have a selection of toys available that will hopefully keep them amused, leaving you to have a relaxing 5 minutes! I also offer a Linen service, which includes all duvet covers,sheets,and tea towels if you require it,@ a cost of between £20 & £40 per week, depending on occupancy.Beds will be made up ready for you to use,saves packing space in your car and time when you arrive . Of course you can bring your own if you prefer. Duvets,pillows Mattress protectors are all provided.Please bring all your own Towels and Beach Towels.A travel cot is available if required. 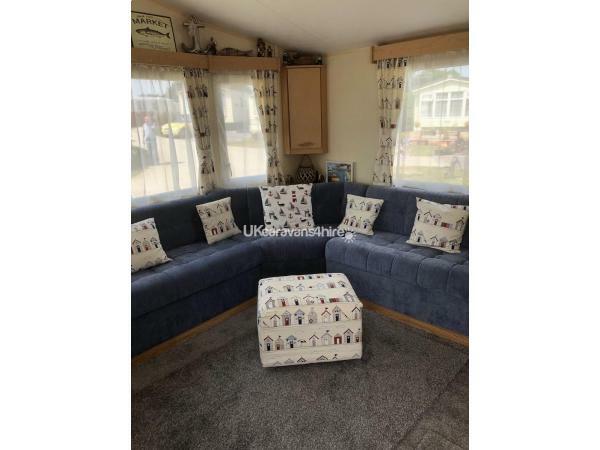 The caravan benefits from a full length South Facing decking which is great for Alfresco dining and for the children to play safely within sight. Outside table and chairs are provided along with some fold up camping chairs. 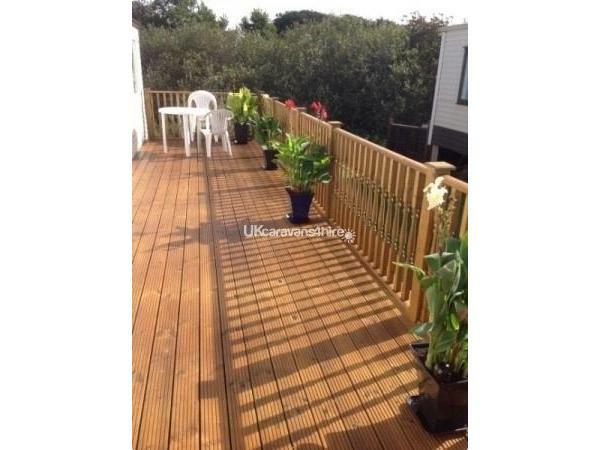 Next to the decking is a space for your car. Seven Bays Park is dog friendly, we welcome up to 2 dogs in our van as long as they are well behaved, clean and up to date with all their jabs and flea treatments. We do charge £20 per week for your dog and a medium sized crate is available if required. They are required to be on a lead around the park except for in the designated dog area where they can run around. You must clean up after your dog in all areas. On Seven Bays Park there is a cafe/bar with free Wi fi' serving breakfast,snacks and Dinner. A short walk onto the adjacent site gives you a shop and children's play area,and another bar/restaurant. St. Merryn itself is a short drive away and has a petrol station, fish and chip shop/cafe, Chinese take away, surf shop, bakery/deli, bistro, tea room and 2 pubs. About 4 miles away is the lovely Padstow with its many attractions including Rick Steins Fish shop/restaurant, harbour, Lobster hatchery, Theatre and many individual shops and restaurants. The Camel Trail for cyclist and walkers can be accessed from here too. 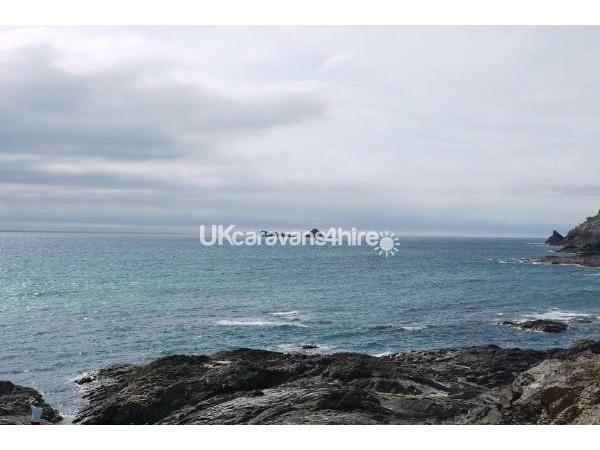 Further afield you have Newquay, with its many tourist attractions and night life. 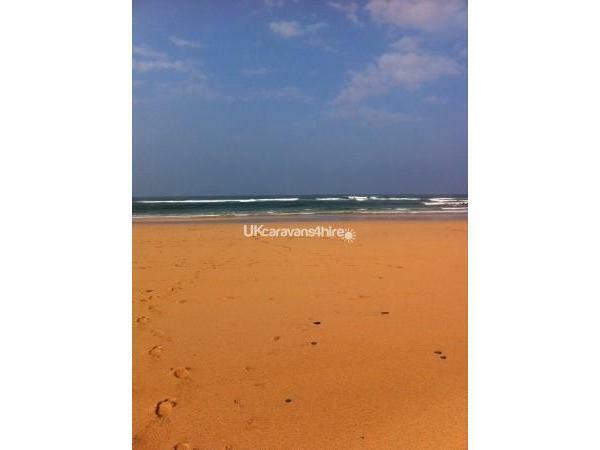 There are no less than 7 beautiful beaches close by locally known as seven bays for 7 days all within a short drive. The Eden Project and Crealy are also just a short drive away. So if you have never been to this part of Cornwall before, now is the time to come and see all that this lovely North Coast has to offer.